The Russian Government is not opposed to the U.S.-led campaign against the dreaded terrorist group but demands that it be conducted with the right means and against the right target. For some time now, speculation has been growing regarding the kind of strategy the United States will pursue to counter the alarming spread of the Islamic State of Iraq and the Levant (ISIS), a fundamentalist Sunni group whose militants have taken over large swathes of Iraq and Syria in recent months. While the United States has been attacking ISIS militants in Iraq since August, it was unclear whether Washington would follow this policy with regard to the radical group’s forces in Syria. On Monday, Sept. 22, the world got its answer: The United States and its Arab allies launched a series of airstrikes against ISIS in Syria, reportedly killing dozens of fighters. However, it is important to note that the U.S. took this action without a resolution from the UN Security Council – a step advocated by Moscow. The sudden rise of ISIS has taken the global community somewhat by surprise, and has left the Middle East in an extremely rare situation, in whichthe whole region faces a common enemy. "ISIS presents a serious threat for the security of all countries of the region, even those that are hostile to each other. Iran and Saudi Arabia, which are antagonists, say it openly; Jordan and Turkey, less openly, whereas Iraq and Syria are already at war with ISIS,” Tatyana Tyukayeva, an analyst with the Foreign Policy agency, told RIR. “This group has an extremely radical ideology, pitting it against all Sunni states in the fight for dominance of the Muslim world. It declines even a conception of existence of numerous Muslim national states, telling that all the Muslims should be united in one single religious state - the Caliphate. For Shiite Iran, the Sunni ISIS is an enemy by definition, as the militants, for whom the history of Shia-Sunni confrontation in the region is sacred, are killing Shiite Muslims on their territory en masse." The U.S. therefore had a unique opportunity to create a broad coalition of countries to fight against ISIS, of which Secretary of State John Kerry and President Barack Obama have spoken more than once. However, this fight must take place not only in Iraq, but also in Syria. And here U.S. policy becomes more complex, as the U.S. has another enemy in Syria – the regime of Bashar al-Assad. There are two possible options for the White House here: a confrontational one and a constructive one. The former is a lose-lose option. By choosing confrontation, the U.S. will have to fight either against two sides at the same time (which will require a lot of forces and weapons) or against one (which will inevitably lead to the victory and strengthening of the other). If, however, the U.S. pursues a constructive approach, there is a chance to establish relations with one of the forces inside Syria. Thus, in theory, the war against ISIS could allow the U.S. a dignified way out of the Syrian trap. The Syrian authorities have already announced that they are ready to cooperate with the United States. "Syria is ready to coordinate all efforts at the regional or international level to combat terrorism. But any attempt to fight terrorism should be agreed with the Syrian government," said the country's foreign minister, Walid Muallem. This is why the U.S. appeared to have given up the constructive approach and found a third option: Congress passed a law on supplying arms to the Free Syrian Army, the secular opposition group that is fighting both against al-Assad and against the Islamists. Russia isn’t pleased with this option. To begin with, Russia is unhappy with the opposition group the Americans have chosen as Moscow considers it too weak and biased. "It is extremely risky to hope that the fight against ISIS will be spearheaded by the so-called moderate opposition as long as it gets decent weapons," said Russian Ambassador to the UN Vitaly Churkin. Isayev also believes that any weapons the U.S. would supply to Syrian opposition groups would simply be captured by ISIS. According to him, while at first the Free Syrian Army felt quite confident that all its divisions were united in their hatred of Bashar al-Assad, “later when issues of allocation of powers and of governing captured territories came up, the group effectively broke up. Some of its members surrendered to the authorities during amnesties; others – in search of real power and money – joined ISIS." Russia is also concerned that the U.S. will give in to persistent requests from the Free Syrian Army and other American allies in the region to carry out strikes not only against Islamists but also against forces loyal to al-Assad. This is why, according to Russian Deputy Foreign Minister Mikhail Bogdanov, Russia supports a "consolidation of international efforts to counter terrorist groups in Syria, Iraq and other Middle East countries, provided the sovereignty of the states of the region is observed and these is coordination with their lawful governments." Russia is of the opinion that if the Americans were unable to agree publicly with the al-Assad government, a session of the UN Security Council should have been convened to clearly establish the parameters of any military operation. Washington, however, objects. 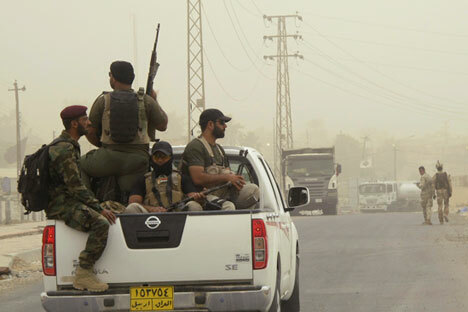 Samantha Power, the U.S. ambassador to the UN, said that the United States has the request of Iraqi government to save their country from Islamic State, and that plea is a sufficient basis to attack the terrorists on Syrian soil.